One problem that the emergence of Big Data and the Internet of Things has highlighted for all of us in IT: There is data everywhere. On desktops, on servers, in databases, in logs, on phones and tablets, in your pants drawer -- you cannot escape it. Its corollary: The volume of data will continue to grow -- and data needs space. Data needs disk capacity. Other than exhausting your budget on spinning disks, where can you as an administrator turn to increase capacity inexpensively and, perhaps most importantly, quickly? Why, the cloud, of course! Or at least that is what Microsoft would like you to believe, as it brings to market its new StorSimple 8000 series of storage appliances. At its core, the newest revision of the StorSimple products aims to make the boundary between storage on your own premises and storage in the cloud invisible. StorSimple has been around for a while, but Microsoft purchased the product line in 2012. The main change here from the pre-Microsoft version is the refreshed hardware and the Azure integration. StorSimple aims to solve both of those problems. I've had a chance to review the device and its positioning, and I'm impressed with it from a technical perspective. I'm less sure of its overall value proposition. But let's dig into the details a little more and see what these new arrays have to offer. The 8000 series arrays have 10GB Ethernet connections, which help achieve a reported bandwidth increase during data transfer of 2.5 times that of their predecessors. The appliance is a SAN in a box, with full multipath I/O, dual controllers, dual power supplies and dual cooling, along with RAID and hot spares and all the redundancies you would expect out of an enterprise-class device. The "in a box" part is important, though, because it's a sealed box you can't upgrade later. It stays in one configuration until it's retired. What's unusual about the StorSimple 8000 arrays is the addition of a cloud tier to the traditional storage tiering approach. Storage appliances and SANs have long used tiering as the best way to achieve performance at an acceptable cost. Windows Server 2012 and Windows Server 2012 R2's built-in Storage Spaces technology also allows for tiering: Files and folders that are frequently accessed are stored using solid state drives to allow for really fast retrieval. Once those files and folders have gone cold, the array or service automatically moves those colder files to the lower-cost and higher-capacity, but slower, traditional spinning media. Generally, goal is to keep 15% or less of total storage in the hot tier, and move the remaining 85% or more of the data to other, colder tiers. This is the best balance between cost and performance. Almost all storage appliances today have a cold tier that consists only of spinning media, which is cheaper than solid state, of course, but slower. StorSimple's arrays provide a third option -- move the coldest data out of the cold tier on the local array and over to the cloud. In this case, the cloud is Microsoft Azure, and the cloud storage option is a specialized version of traditional Azure blobs -- binary large objects or, basically, just files as unstructured data. The data that is passed back and forth to the cloud storage tier is encrypted both in transit and at rest using an encryption key that Microsoft says it cannot access in any way. In addition, StorSimple automatically manages the two local storage tiers and provides compression services to maximize space. It also dedupes based on the Windows Server 2012 deduplication technology, which has been proven to be very effective -- in some scenarios (virtual desktop infrastructure in particular) achieving an over 90% space-savings rate. It also provides snapshot backup capabilities, so in the event some data gets deleted accidentally, you can restore a snapshot backup from before it happened with just a couple of clicks. Both 8000 series arrays use iSCSI to present raw space to your network and its various resources. The iSCSI SAN connection adds the array's space to your current storage network, and the arrays use a standard Internet connection to reach out to Azure to enable the cloud storage tier feature; there are no special tunneling requirements needed to get that functionality going. 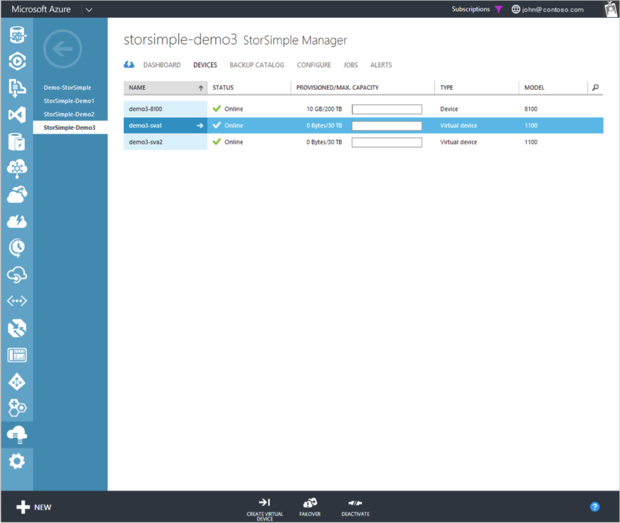 The Microsoft Azure StorSimple Manager service interface, showing one 8100 physical array and two virtual arrays. The Azure StorSimple Virtual Storage Appliance is a pseudo-device that lives up in the Azure cloud. It consists of Azure virtual machines (which you pay for, of course, as part of a compute charge), virtual networks and Azure storage (which you also pay for). Consider it a "clone" of your physical appliance, but running up in the cloud. You can use it for obvious applications, like disaster recovery -- the virtual appliance can spin up and your users can access the data stored on it seamlessly, so it takes the place of an expensive secondary hot spare site and appliance. This could result in cost savings for high-availability services. The virtual appliance can access any data that a physical StorSimple array has uploaded into Azure. You can use the data that was moved up to the cloud to perform Azure-specific testing, deploy workloads using the previously on-premises data and migrate some virtual machines up into Azure that you previously ran on-premises. The Microsoft Azure StorSimple 8100 and the Microsoft Azure StorSimple 8600 have been available for purchase since August 1. While you will still be able to buy the previous versions of the StorSimple appliance -- the 5000 and 7000 series -- they do not support the Azure StorSimple Virtual Storage Appliance and, according to Microsoft, there are no plans to add that support. To play in the cloud, you need the 8000 series devices. Both 8000-series arrays sell for $100,000 and up. Think of this as a conduit through which you can transition large amounts of data back and forth between your existing network and Azure. Once the data is within the virtual storage device, using it with Azure services becomes an easy and fast proposition, versus having to transmit data up and down, over and over, every time you start a new project for evaluation or workload for production. 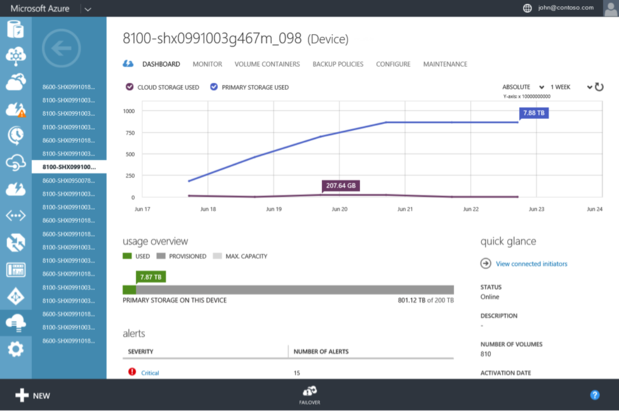 You can spin these virtual devices up really easily from within the Azure portal; the screenshot below shows what that looks like -- a single screen where you name it, tell Azure where it should live on the network and also what storage "subaccount" it should use -- and you are off to the races. 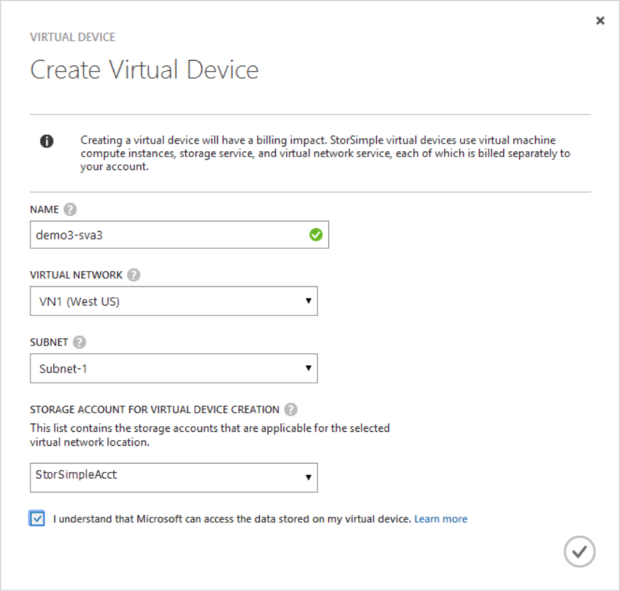 Creating a new StorSimple virtual device within Microsoft Azure. I'll tell you what I find to be the most troubling aspect of the StorSimple 8000 series: It is oriented to large, well-heeled enterprises only. The arrays start over the six-figure mark, which puts them out of reach for small and even medium-sized businesses. The lower-capacity 8100 array will set you back over $100,000 and the 8600 model sells for up to $170,000. Seagate is the primary manufacturer of the StorSimple physical array; its pricing is shown here (PDF). Microsoft says you should reach out to your channel or sales manager if you are interested in buying StorSimple, which leaves open the possibility that these prices are not terribly firm. But getting into StorSimple even at a discount evidently requires a substantial investment. While there is a significant amount of local storage in these arrays, which does come at a cost, I wonder if a StorSimple "4500" that has a third or a fourth of the local storage but still works with the Azure Virtual Storage Appliance might be an easier sell and a better fit for a wider swath of businesses. As it stands, only a large enterprise can swallow the full-boat Azure StorSimple price tag. Even when you get past the price and the positioning, there is another serious drawback: The device can migrate storage only to Microsoft Azure. While this is somewhat to be expected given that Microsoft owns the business now, a device this expensive could reasonably be expected to service other public cloud providers as well. Microsoft provides differentiated pricing for the cloud storage capacity used by StorSimple devices, and one would expect it is cheaper than the standard Azure "blob" storage you would get just signing up for the Azure service as a retail customer. But a discount is small dispensation when you've spent $100,000+ on a device tied to a single service that is at that service's mercy. This is particularly worrying when you consider the fact that the previous version of these arrays supported connections to the Amazon S3 service as well as Windows Azure. Removing capability on a device with a price tag this big limits the utility of these devices; a significant feature will disable itself if you decide to move from Azure to another cloud provider. I am not sure how this can be anything other than a significant drawback. I struggled with formulating my opinion of the new StorSimple 8000 series. It's the first release of the StorSimple hardware after Microsoft bought the business a couple of years ago; much of the work the company has done in that interim period was to bring StorSimple closer to Azure and make it a cloud-friendly solution. That effort is to be applauded, because the idea of a device essentially "failing over" storage capacity into the cloud is great. You have up to 500 terabytes of storage capacity over the three tiers (local SSD, local spinning media and cloud) with the 8600 array. That capability is great. It is versatile and solves the problem of data growth and protection for most enterprises. From a purely technical standpoint, the product is very sound. What I have a hard time with, ultimately, is how the price tags of these devices -- plus the fact they link up to Microsoft Azure only -- make this a proposition of limited utility. I can't help but believe that the drawbacks outweigh the benefits on this one for most businesses. The bottom line, from this reviewer: Enterprises that have standardized on Microsoft Azure and have a six-figure storage budget may be interested and will find a very capable device that has a great set of features. Everyone else can simply move on, or perhaps wait for a lighter version that is a little easier to swallow budget-wise.